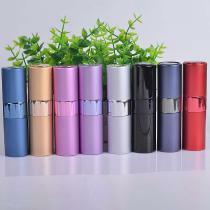 2.Ideal for storing your favorite perfume or aftershave bottle in a smaller and safer metal container. 3.No need to take the whole bottle with you on holidays. 4.Lightweight and durable aluminum material makes it ideal for placing in your purse or bag. 5.Suitable for nights, office or any other occasion where you want to refresh.